There are certain foods I love the idea of, but which never really live up to my expectations in their execution; scallops, for instance. Don’t even get my husband started on how many times I have ordered scallops in a restaurant and then been disappointed. Fried chicken is another. I love the sound of chicken soaked in buttermilk and fried to a crunchy, well-salted shell with tender chicken within, but am frequently underwhelmed, even at restaurants I count among my favorites. It’s me, it’s not you, I want to tell them. Finally, though, I may have met the fried chicken I always think I am going to get. It came in a huge, thick portion piled on a toasted bun with red slaw at the just-opened Van Horn Sandwich Shop on Court Street, Cobble Hill. I don’t usually write about places after only one visit but an hour after finishing that sandwich, and I am still thinking about biting into the delicious fried chicken. A pickle and some tastily dressed greens come with the simple sandwich. There are a bunch of other Southern-style sandwiches, including a cornmeal dredged catfish, smoked pulled pork, a blt and a vegetarian version with smoked sweet potato strips, a plt. Plus, there’s a peanut butter and jelly sandwich ideal for kids, and for their parents, a beer and cocktail list. I have to return with a gro up next time to justify ordering a Pimms Cup and sides of hush puppies, mac and cheese, roasted beets and collard greens. Van Horn Sandwich Shop is a collaboration between architect Jacob Van Horn and chef Rick Hauchman, who both grew up in Chapel Hill, North Carolina, and crossed paths again years later in Brooklyn. While Southern at heart and in menu, the eatery has a clean, modern feel with high bentwood stools and plenty of bar space so that eating alone, as I did, doesn’t feel conspicuous. It’s also entrenched in the neighborhood by sourcing ingredients from local producers including Caputo’s Bakery and Paisano’s Meat Market. Until now, the location at 231 Court Street has seemed somewhat cursed. It previously housed Café Ribant, which formerly went by the name Café Mei Mei, and never really took off as either. And it was Jill’s before that. I’m rooting for this sandwich shop, and I think all bodes well, especially with much-acclaimed newcomer Brucie across the road, Strong Place and Karloff down the street and stalwarts like Quercy and Sam’s Restaurant just a stone’s throw away. 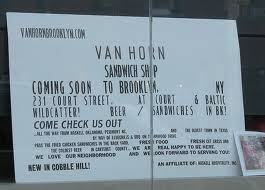 Van Horn Sandwich Shop is at 231 Court Street, between Warren + Baltic streets. ; phone: 718.596.9707. Honestly – you & food…. sounds like a heart attack on a plate. Love the idea of a fried chicken sandwich. I am definitely getting myself there to try this. It is worth it; the fish sandwich is next on my list! My husband and I have been meaning to check Van Horn out since it opened. Glad to hear it’s good. The fried chicken sandwich sounds terrific. As for your frequent fried chicken disappointment, have you tried Buttermilk Channel’s chicken and waffles? Van Horn is fast becoming one of my favorites in the neighborhood …the staff are super sweet too! As for fried chicken, I love Buttermilk Channel, but their chix/waffles dish overwhelmed me – perhaps I should give it a 2nd chance. I’m big on seasoning, and Van Horn’s chicken is just salty/seasoned enough …mmm, thinking of a sandwich now.